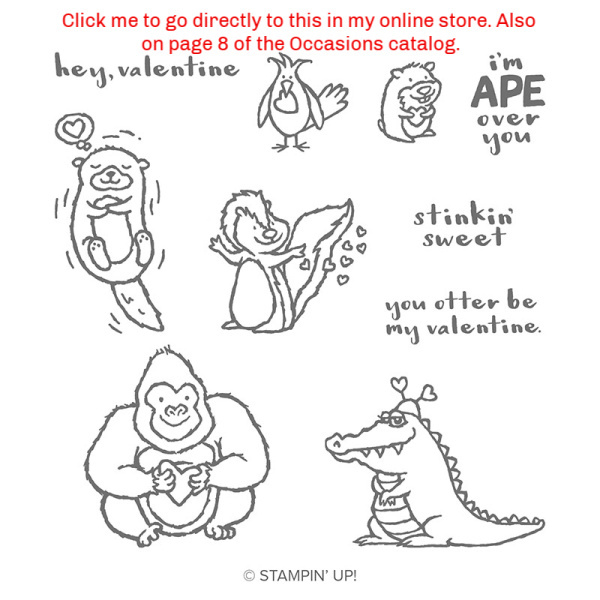 As an added bonus, today I am sharing TWO totally different Valentine cards using the same stamp set - Hey Love. 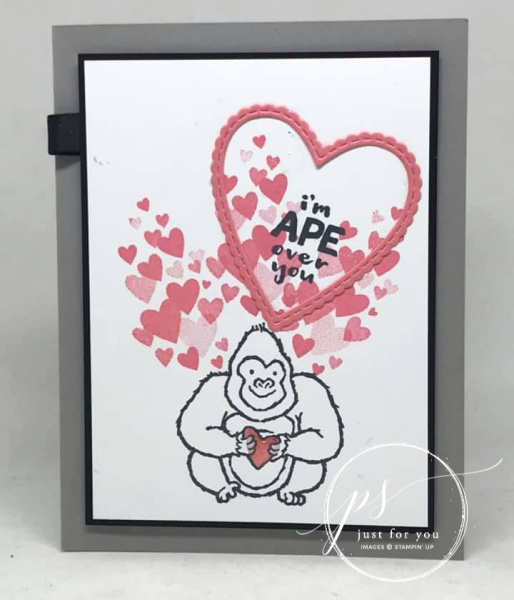 Stamp the gorilla on 3 1/2” x 4 3/4” Whisper White layer in Memento ink and color in heart with Flirty Flamingo Dark Blend - add Heart Epoxy Droplet over heart. Stamp flourish of hearts with Flirty Flamingo ink and sentiment with Memento ink. Die cut Flirty Flamingo heart in Big Shot and adhere to card front to frame sentiment. Add Whisper White layer to Basic Black layer with Liquid Glue. Add little folded piece of Shimmer Ribbon to back of black layer in top right with a piece of tape. 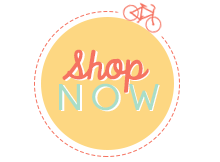 Add all to card base with Stampin’ Dimensionals. Adhere the DSP to the Flirty Flamingo panel layer. With the largest Stitched Oval and the tag from Stitched Labels and the 3”x5” piece of Whisper White along with the largest Scallop Layering Oval and the 3x4” piece of Flirty Flamingo, run through Big Shot and die cut all 3 pieces. With Memento Tuxedo Black ink, stamp the Otter image on the white oval, and the greeting on the small tag. 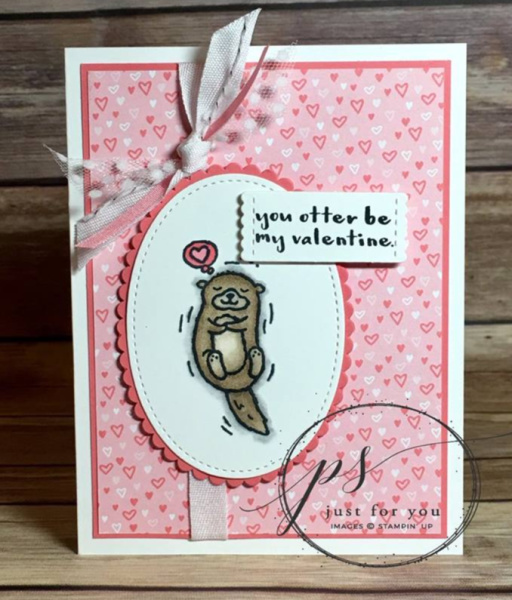 Color in the Hearts with the Flirty Flamingo blends and the Otter with the Crumb Cake blends. Use the light Smoky Slate to create a small border around the Otter. Use the Color Lifter as desired to highlight or lighten areas. Adhere the White oval to the Flamingo scallop oval; adhere the greeting tag to the right top corner with dimensionals. Adhere the 7” piece of white ribbon to the left edge of Flamingo/DSP panel layer with glue dots behind the top and bottom. Adhere the Oval image to the panel layer with dimensionals overlapping the ribbon, leave about an 1” to the top edge for your ribbons! Take all 4 of the 6” pieces of ribbon and tie them in a knot around the vertical strip of ribbon. Trim ends and use mini glue dots to secure the knot to the card.